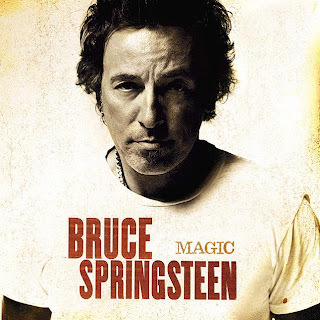 Six years ago today, Bruce Springsteen released his fifteenth studio album, Magic. It was his first album with the E Street Band since The Rising, which was more or less the gateway album into my fandom (as it was for many younger Springsteen fans). With that in mind, Magic had a lot to live up to - the last two albums, while they have grown on me in retrospect, were not the classic Springsteen sound that hooked me. However, I really haven't given the album much of a listen in several years, and many songs from it were noticeably absent in the Working on a Dream and Wrecking Ball tours. So, in the interests of the current blog post you are reading, I decided to re-immerse myself in Magic, hoping it didn't lose any of its...um...charm. Instead of keeping you in suspense, I'll let you know up front: it is still amazing. What is really outstanding about the album is it is just chock full of songs that, had they been released earlier in Springsteen's career, would be iconic hits for the boss. The zenith of the album is "Livin' In The Future", which brings back the classic E Street sound from the Greetings from Asbury Park days. In the track, the band is fast and free-wheeling, perhaps being influenced by the Seeger Sessions. The lyrics are Springsteen turned up to his "Madman drummer bomber" level of zaniness, as we are treated to monkeys on leashes and barrel-piston-esque boot heels. "Girls In Their Summer Clothes" was the album's biggest hit, as it encapsulated a unique and specific summer feeling that is rarely touched upon - the summer song of the aging. Trust me, when I go to the Jersey shore and start seeing how much younger everyone than me is, you can be certain that I always grimly shake my head, put my headphones on, dial up "Girls In Their Summer Clothes", and slowly walk away. I really do watch too many movies. But the albums hits don't stop there. "I'll Work For Your Love" also sounds like an early Springsteen track, as the haunting piano and religious imagery were Springsteen's modus operandi in the Born to Run era. "Long Walk Home" is an amazing companion piece to "My Hometown" - you could easily see one segueing into another during a concert. Even when Springsteen goes slower and sadder on this album, he absolutely nails it, making "Terry's Song", a tribute to Terry Magovern, a touching tribute that I'll write into my will to be played at my funeral. And that just concludes what I consider to be the A-list songs, but there are several songs that are solid additions to the Springsteen catalog, such as the aforementioned "Radio Nowhere", "Gypsy Rider" (this is a near classic, as the opening is amazing, but I just wish it was more subdued throughout the whole song), and "Last To Die" (could have easily switched places with "Radio Nowhere" as the leading single, but the lyrics may have been too political). If I had to list any criticisms, it would be that sometimes Bruce's voice is over-manipulated (as in "You'll Be Comin' Down Now"), making him sound flatter and removing the "raw" quality from his voice. Also, the title track leaves me flat, as it is too dark for my tastes, yet the tune of the song is not that bad (it could easily be re-appropriated into a love song), and it is the shortest song on the track. As I mentioned before, this album is an instant classic, and I'd easily rank it among Springsteen's ten best, if not in the top five. It is a shame that we don't hear Springsteen play more tracks from this album in concert, as not hearing it live could make fans reluctant to continue to listen to it. So, if you have overlooked this album recently (as I had before this article), do yourself a favor and give it another spin - you won't be disappointed.